Source: received from author for honest opinion of it. 7-year-old super-spies Chase Danger and Princess Ali Bali must think fast when they discover pirates have stolen Zalezgon's magical pineapples. But that's not all! Ali's little brother Aiden has been kidnapped by the dreaded pirate Captain Looney, who is planning on taking over the world with his newly invented Weather Rockets! Hang-gliding, jungles, giant sharks, super Roller Coasters, pirates, and a sky-dive will keep your children's attention from start to finish and give them a thirst for adventure! I just love Chase Danger! If you just look at the cover you can tell this is one little boy who can get the tough jobs done! But then add to the mix, a mysterious little girl and they make a great team that makes this book for both boys and girls. I love the graphics in this book. All the different colors, the different characters being portrayed, makes me get excited and my children are no different! When we got book #2 in the mail, all I could hear was squeals of happiness as they ripped open the packaging to get their hands on this book. Do you know what makes this book even more better? The fact that it brings together all of my boys. My nine year old twins love it because of all the action and different spy gadgets; my seven year old adores Chase and Ali Bali and loves reading it out aloud, and my four year old loves to sit among his older brothers listening to the read-along cd that comes with it; not to mention he loves sword fights. I think this would be the perfect gift for that reluctant reader or any child that just loves a really good story! ***** stars for me! We loved the first book but I think this one just made it even better! When we first got our hands on this book, (we jerked out of our mom's hands-sorry Mom) all we wanted to do was just look at the pictures before we even started reading it. Anthony and I just love the pictures! We have even tried our hand at drawing a couple of Chase Danger scenes, but we aren't really that great at it. Anthony: Okay hands down, my favorite part is when they ride the roller coaster and then shoot into the sky! This is why I will not ride a roller coaster at Six Flags; you never know when this could happen! (Okay, so it is probably next to impossible...) But it was pretty exciting reading about it. I really like Chase but my favorite character is Ali Bali. She is so tough and I think she makes a great friend for Chase. This is one of those books that is great for older and younger kids, girls or boys. Conner: We have really gotten into comic books lately. Our dad bought us a lot of comics the other day. That is a major reason I like Chase Danger so much. It is written out like a comic book would be. It is easy to follow along to and the read along cd makes all the action seem to come alive. After listening to it the first time, our little brother, Jace, picked up a toy sword and started pretending he was Chase. It was really funny, but even more funnier when our other brother, Mikey, decided he was going to be Captain Looney. He does that part really well-he is kinda crazy. I like that we have this story that all of us can enjoy. It's something that us big kids can read, but little kids get a real kick out of all the funny scenes, like with the shark. In fact, we all kinda laughed at that one. I am a huge fan of spy movies, like Spy Kids, and this series is a lot like that. It is funny, exciting, and has a lot of interesting different characters. Even the villains have some cool parts; but it the most fun watching Chase and Ali put the bad guys away. I wish we could give it more than five stars; like a hundred! Because it is really that great! Mikey: I think it is super cool that Chase and I are the same age. I always like to imagine the different things I could do, like travel to outer space, but it is really fun to act out the scenes from the Chase Danger series. Chase and I have a lot in common, but most importantly, we get our strength from eating pizza! I love pizza, though not really pineapples much. My favorite scene was Operation Baby Safe. I love little babies and it was funny when Chase said, "born potty trained!" I can understand how Aiden gets his feelings hurt from his sister. My brothers tend to do that to me and it is easy to think they don't care about me. I am just glad my feelings can't set off rockets! That wouldn't be good at all! I really liked the surprise we find out in this book and I can't wait for book 3! Jacey: I love the sword fighting! Yah! I like to hear the sounds that come from the cd and I always get to turn the page too. I am even learning which words are Chase, spy, and Danger. I really like this book a lot and I always get really excited to hear it before I go to bed at night. Sometimes, its fun just to listen to the cd, and other times I like hearing my mom read the book to us. She does pretty good voices with our different stuffed animals and she can read books pretty good too. I want to give this book as a present to our cousins for Christmas. 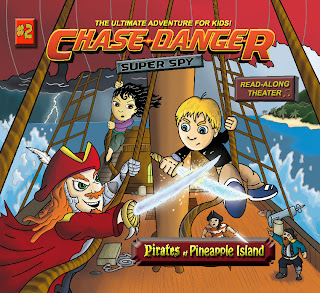 All in all, we have all talked and decided Chase Danger Super Spy and The Pirates of Pineapple Island deserve five stars! This is one of those books that you can read over and over again and it just keeps the excitement level constant! Make sure you stay tuned in the next few days because we will be having an interview with someone very special to this series.